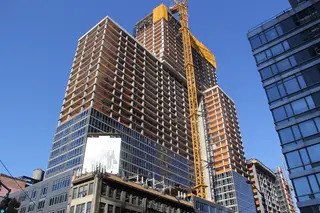 TF Cornerstone (TFC) recently topped off construction on their immense new rental development at 606 West 57th Street. 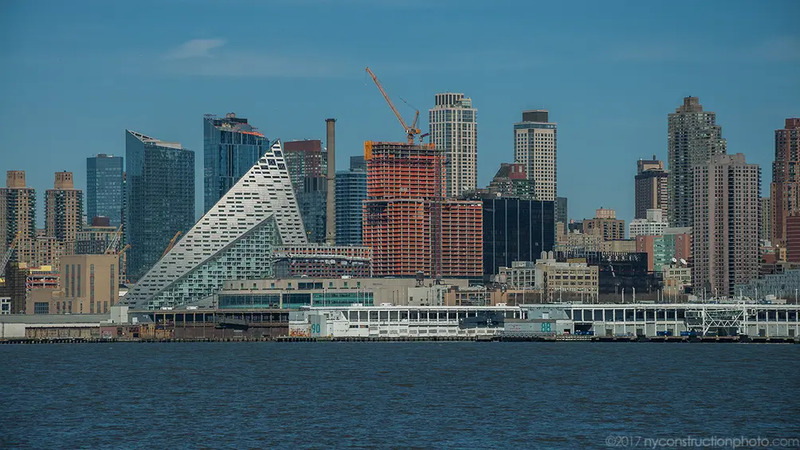 Rising 450-feet-high from a lengthy site near the Hudson River waterfront, the building clumsily staggers skyward in large rectangular volumes. 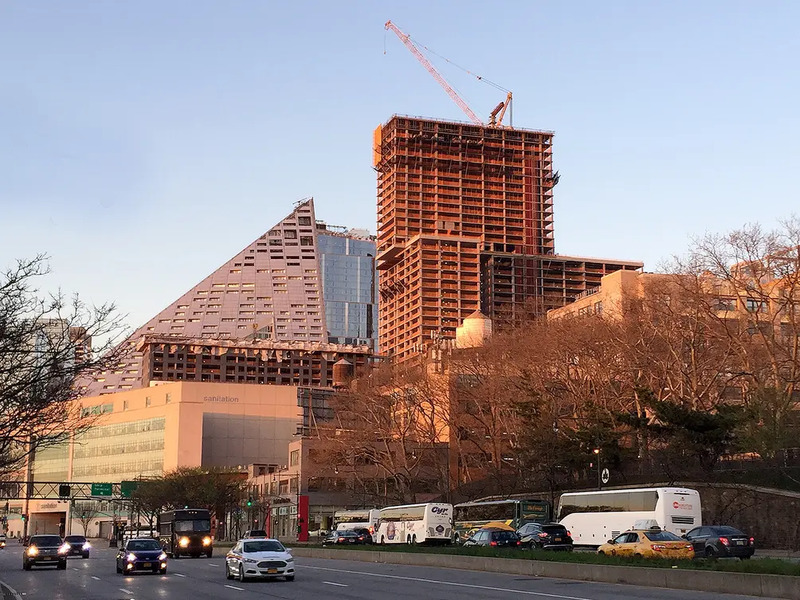 In its raw unclad glory, its form serves as a counterpoint to the pure geometry shown in Bjarke Ingels’ tetrahedron next door. 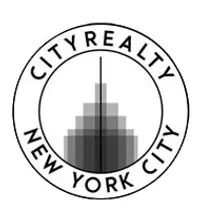 In a press release the team says that it was crucial for the 42-story building to flow with the skyline, and connect to its context. 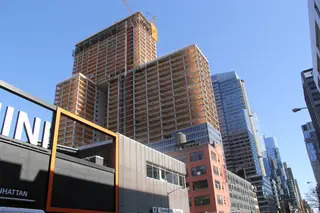 TFC is again collaborating with the design and architecture firm of Arquitectonica who previously crafted several of their East Coast towers in Long Island City. 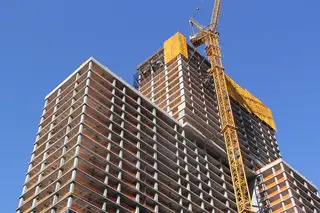 Known for their lively designs and use of color, Arquitectonica’s work in New York includes the Westin New York at Times Square and Related’s rental tower MiMa. The firm’s work has grown much more commonplace in warmer climates with dozens of sleek towers realized in South Florida and Latin America. 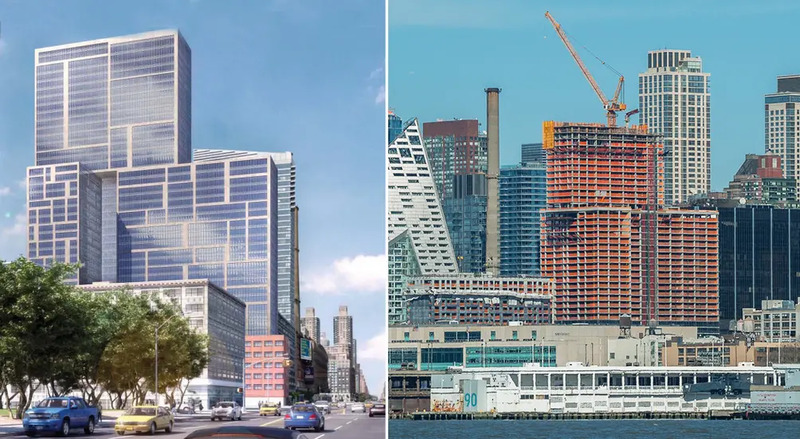 With a mighty 1,028 units planned inside the 1.2 MSF tower, 606 West 57th Street will be among the largest stand-alone rental developments ever undertaken in New York City. Arquitectonica was tasked with finding an elegant solution to fit the incredible amount of bulk onto the oddly-shaped parcel. To help do so, two rows of recessed sky bridges run up the tower, cleverly breaking up the mass, and one 25-floor volume appears to have been rotated 90 degrees. All in all, the firm says the playful stacking is to support the perception of movement and to lighten the impact of its perceived density onto the skyline. A dark-grey colored brick is now slowly covering up the lower levels of the structural frame. The firm says there will be an innovative brick and metal-to-glass ratio that will add even more dynamism to the design. There will be 37,000 square feet of retail on the ground floor retail and amenities will include on-site parking, bicycle parking, a rooftop theater, party spaces a clubhouse, a pet spa and an indoor basketball court. Across 57th Street, inside Via 57 West, will soon open an upscale multiplex theater. 606 West 57th Street is expected to be fully complete in 2018.